Many businesses fail to use competitive intelligence (CI) to their advantage, despite studies that indicate that business success is directly linked to a strong CI program. A powerful “how-to-do-it-better” book, this is the first guidebook on competitive intelligence that uses case studies to provide behind-the-scenes insights into how professionals improve competitive intelligence processes. All organizations need to stay competitive in their respective fields to ensure success. Competitive intelligence (CI) is an established discipline that focuses on giving businesses and nonprofit organizations the advantage of staying fully informed about what their competitors are doing, are capable of doing, and will likely do. CI is a particularly valuable and powerful tool that supports everything from strategic planning to marketing and new business development to human resources—if it’s executed properly. This groundbreaking book uses real-world case studies to expose common CI challenges and present a simple methodology for spotting problems, understanding how to rectify each problem, educating others in order to bring about improvements in a process, and testing and validating that the changes are working. 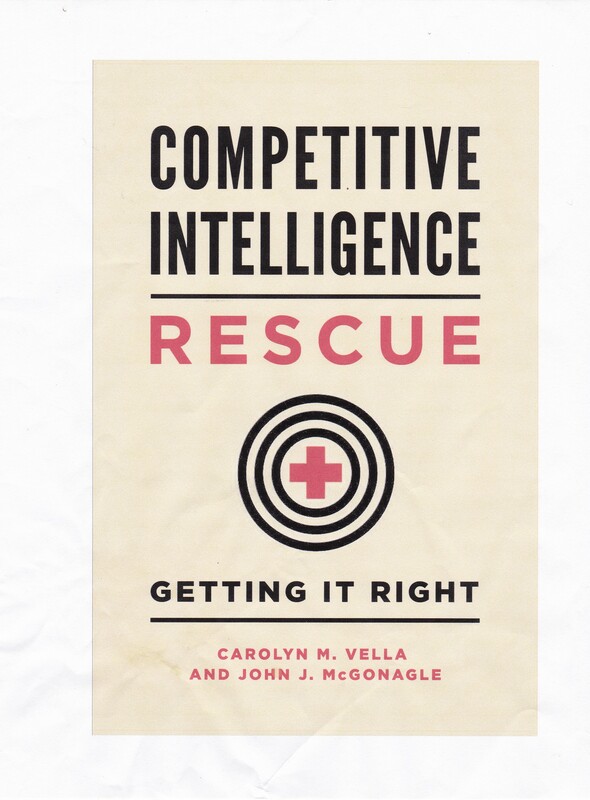 Competitive Intelligence Rescue: Getting It Right provides invaluable insights from Carolyn M. Vella and John J. McGonagle, two of the most prolific authors, recognized experts, and in-demand speakers on the topic of competitive intelligence worldwide. Any manager, executive, or owner of any organization—including medium-sized and large enterprises such as businesses, law firms, hospitals, nonprofits, and universities—as well as anyone inside or outside of a firm who provides competitive intelligence to managers or executives will benefit from reading this book, regardless of previous experience with or knowledge about CI. To buy the book, you can go to Amazon.com. You can also preview it and then buy it at Praeger’s home page for the book. Check out this new review by Ellen Naylor, author of Win/Loss Analysis.